I am a fan of potatoes in every form. Whipped, mashed, smashed, baked, roasted, twice-baked- you named it, I love it. They are such a versatile staple to have in your pantry, and last long enough that you can create a masterpiece in a pinch with only a few additional ingredients you presumably already have on hand. 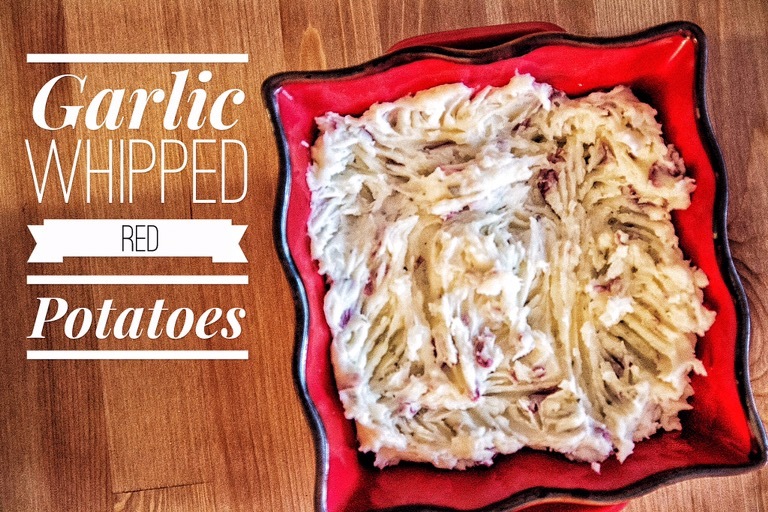 I decided to share my love of whipped potatoes with you. They’re a bit wetter than mashed potatoes, and not as fluffy, but I prefer it this way. They are wet without being watery which is probably the only way you can ruin potatoes in my opinion. 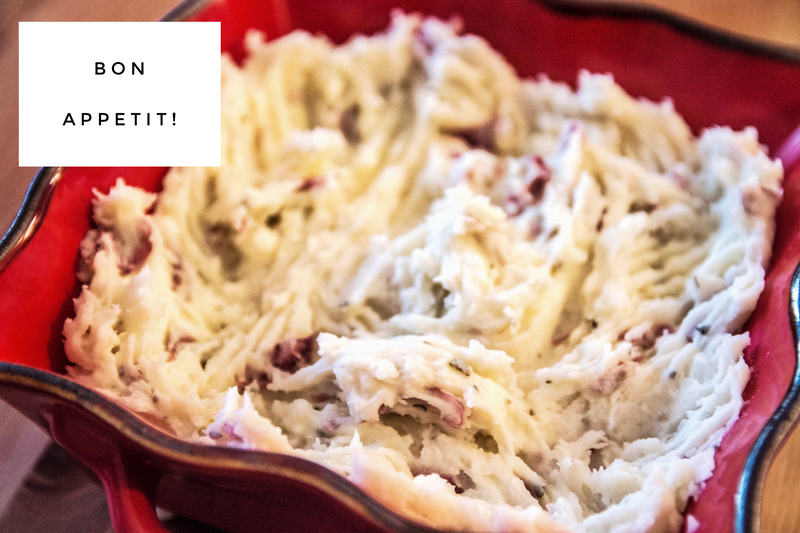 I am not a fan of potato purists who claim that their method is the only way you can make mashed potatoes or the true way of making whipped potatoes. Potatoes are forgiving and potatoes are flexible. We can all learn a lesson from potatoes 🙂 For this, you can probably use traditional, dependable russet potatoes or Yukon gold potatoes (or any potato really) but I think the dash of red this adds to the dish is just FUN. 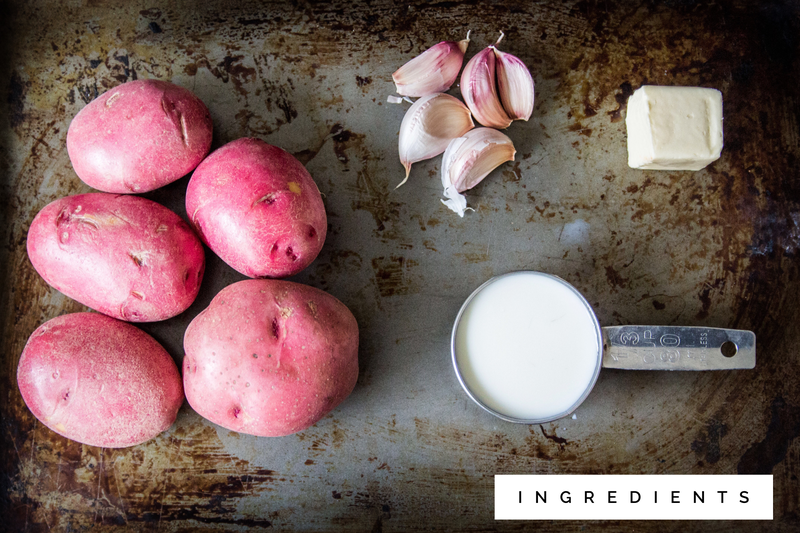 Red potatoes have skins that are thin and rich in nutrients adding a crunch to these potatoes, and some health-stuffs. Throwing in some garlic as the potatoes are cooking is a trick I learned long ago. It softens the garlic and is easily pureed once you start mashing/whipping. It elevates the taste of the potatoes and it’s so easy, why wouldn’t you do it. I do this to every mashed/whipped/smashed potato recipe I make. 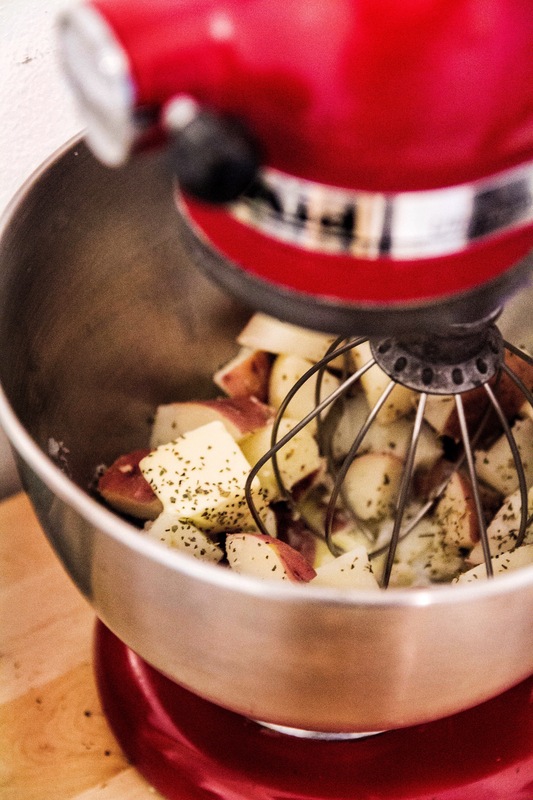 Before I purchased my Kitchen Aid stand mixer, I used to get so peeved at bloggers and cookbooks that guide you to use a stand mixer as a step in the process. I will admit, for some recipes it is required. And for others, it is not required but it makes things a whole lot simpler. Don’t fret though! For our purposes, it is completely not required for this recipe and I only included it because I am a lazy cook and have the mixer ready to use on my countertop. A normal hand mixer will do just fine. And if you don’t have that, then simply mash with a manual potato masher and have some lovely mashed potatoes instead. Cooking is all about being creative with what you have. Bring a medium sized saucepan to a boil and generously salt. Add whole cloves of garlic and potatoes to saucepan and cook for 8-10 minutes. You will know the potatoes have been cooked when you can stick a fork in them and they slide right off. Remove from heat and drain potatoes and garlic in a collinder. 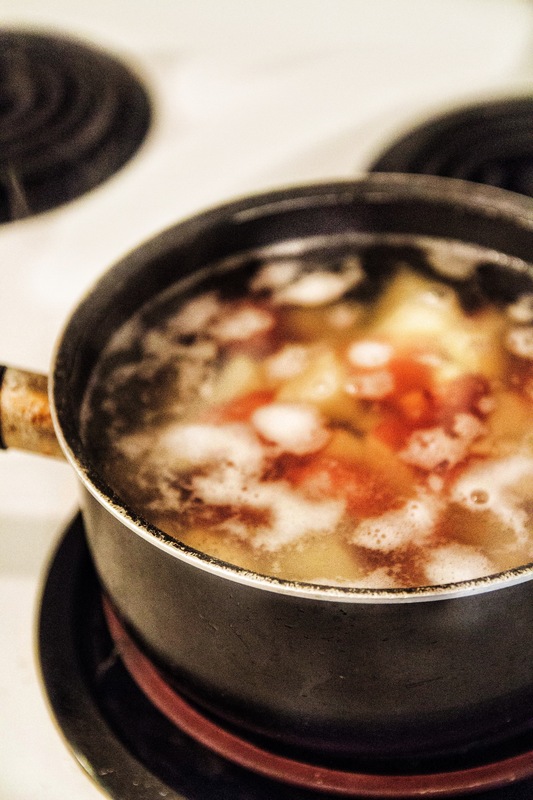 Add potatoes and garlic to stand mixer along with milk, chicken broth, butter, salt, pepper, and oregano. 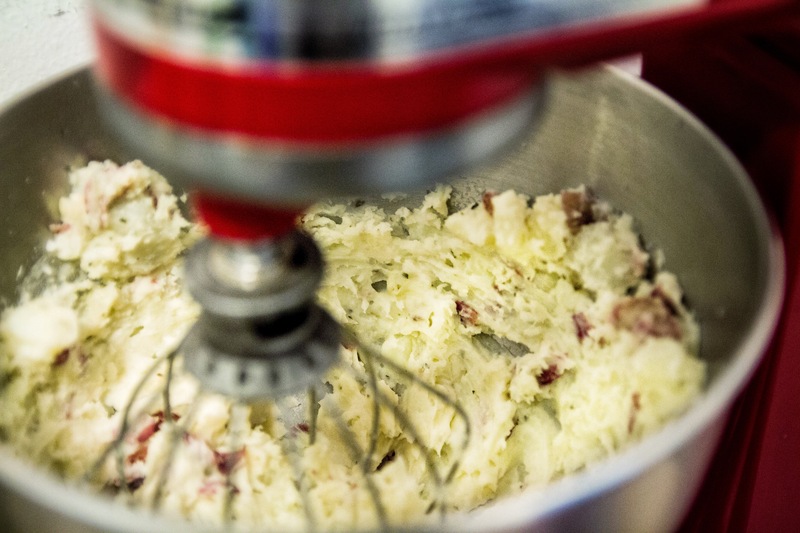 With a whisk attachment, whip potatoes on a low speed for 30 seconds. Then whip on high for 3-5 minutes. Taste potatoes and add additional milk or broth 1 tsp at a time if too thick. Add salt 1/2 tsp at a time if too bland. Enjoy! If you want a really creamy and tasty treat, add two tbsp of sour cream to your potatoes and mix. Amazing! I LOVE garlic and I LOVE mashed potatoes. Thanks for the recipe! My pleasure! I hope you love it as much as I do. Thanks for stopping by!